You roll into Estes Park and your breath escapes you. Not simply from the elevation, but from the grand landscape that is laid out before you. Mountains reaching to the sky, deep valleys, roaring rivers, abundant wildlife. It's all there. These mountains have drawn people to the Estes Valley and Rocky Mountain National Park region for, literally, thousands of years. And for good reason. These hills are special. Sure, it's an emotional experience to walk in the shadows of these giants but an even more rewarding experience awaits those who dare to venture to their lofty heights. To feel the ancient stone beneath your feet, let the thin air kiss your cheeks, and to experience the effort, struggle, and burn in your legs as you take one step at a time toward their summits. It's truly magic. The mountain is not something your conquer. The battle is on the inside and what you conquer is far more formidable. With each step you leave the hustle and messiness of our current lives and culture and get to experience what you were made to do. To explore. To move. To work. To look in awe at creation. To see, first hand, that conservation is essential and that wild places must be protected. It's the antithesis of how we live day to day and for some it is welcome and a relief, and for others it's a struggle and feels different and unfamiliar. These summits are life changing in so many ways. I've seen it first hand in dozens of friends and have heard of more incredible summit experiences, from guests here at the lodge, than I can count. So hit the trail, and as the one and only John Muir so eloquently put it, "Climb the mountains and get their good tidings. Nature's peace will flow into you as sunshine flows into trees. The winds will blow their own freshness into you, and the storms their energy, while cares will drop away like the leaves of Autumn." So now you have the task of deciding which mountain to climb! There are so many within the borders of Rocky Mountain National Park so it can be hard to choose. Here are a few of our favorites to help get you going! Happy trails! En route to Mt Ida. 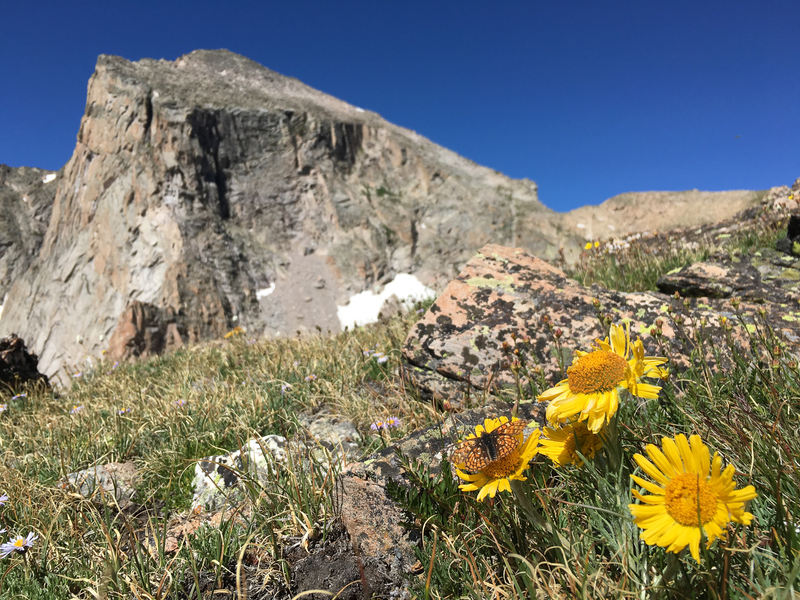 If you're looking for a gentle trail (it's all relative) in the heart of Rocky Mountain National Park that leads you to a lofty summit with expansive views in a not-so-heavily-traveled area, then Mt. Ida is what you're after! Head up Trail Ridge Road to Milner Pass and gear up. Walk along the trail that leads around the right side of Poudre Lake. It will head off to the right and into the forest where it will abruptly steepen into the trees. The steepness is short lived though and once you get above tree line the gradient will lessen a touch. Enjoy the rolling trail all the way to the base of the final summit push. Be sure to stop here and there and soak in the views of the Never Summer Mountains to the west. Once you get to the base of the final summit push, the trail kind of peters in and out. But don't worry, just head uphill and before too long you'll pop out right at the spectacular summit! Be sure to check out the Gorge Lakes far below you. This is one of the more remote and rugged areas of the park and it's really cool to be able to peer into it from high above. Simply return the way you came. Note that 95% of this hike is above tree line and there is no easy place to return to the safety of the trees in the case of a fast approaching thunderstorm. This is a trail that is exposed to elements, so be sure to play it safe and bail out of your summit bid if storms are approaching. 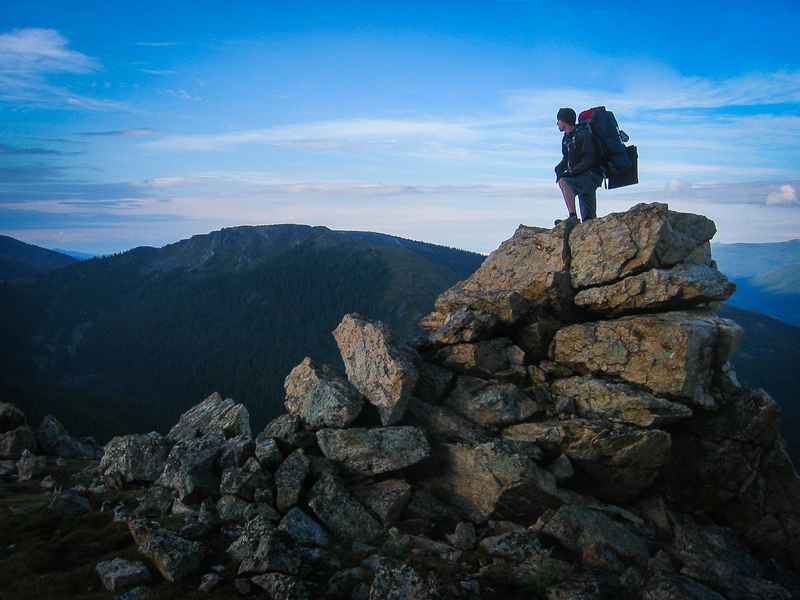 Hallett Peak is one of the more popular summits in the National Park and for good reason! 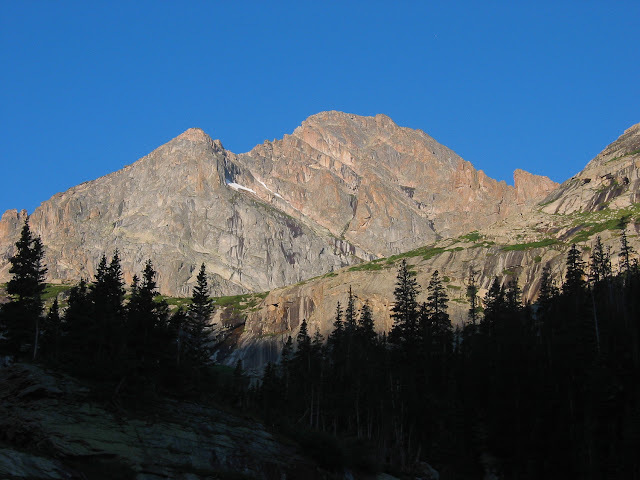 It's summit cone is aesthetic, it's a spectacular hike from trail head to summit, and it's a mountain you can see from just about anywhere in the Estes Valley so it's one that many want to say they have stood atop. Head to Bear Lake and as you're skirting the right side of the lake you'll come to a trail junction with the Flattop Mountain Trail. Take a right here and head another half mile up to another junction. This time with the Bierstadt Lake Trail. Take a left to stay on the Flattop Trail. At the next junction (with the Fern/Odessa Lake Trail), about another half mile up, take another left. Just follow the signs, it's easy to navigate. You'll soon pop out at the Dream Lake overlook and a good spot for a breather and to snap a few pictures of Tyndall Gorge far below. You'll head back into the forest as you continue to gain elevation. The trees will start getting shorter and before you know it you'll be above tree line and at the Emerald Lake overlook. Again, another good spot for a snack and some pictures. Be sure to get a shot of Hallett Peak! It's looking formidable, but keep making your way up Flattop and you'll be on the summit in due time. From the Emerald Lake overlook the trail traverses just about the entire eastern flank of Flattop then turns west toward the summit. Keep plodding up the steepening trail and head for the large snowfield below the summit. Before you reach the snowfield there will be a hitch rack. This is only significant because it's a well known feature of the hike and kind of acts as a launching point for the final summit push for Flattop and, ultimately, Hallett Peak. You'll make quick work of the snowfield and the hike across the long, broad summit of Flattop to a trail marker pointing toward the North Inlet and Tonahutu trails, which lead to Grand Lake. From the sign, take off south (left) across the tundra via an easy to follow social trail. The summit cone of Hallett will be looming high above. Keep making your way around Tyndall Glacier (of which you should, carefully, go take a gander) and you'll soon be grunting toward the summit. Enjoy the steepness. Look behind you at Grand Lake and the divide as it snakes its way to the west and north. Gaze over at Flattop to see where you've come from. The summit will materialize sooner than expected and you'll be on top of one of the best summits in the park. Enjoy it and bask in your accomplishment! Be sure to fuel up, because now you have a 5 mile hike back to Bear Lake. Just go back the way you came. Bonus: If your feeling up to it, if the weather is good, and if you have the right gear, keep heading south along the dive and summit Otis Peak. From there you can descend via Andrews Glacier if you have proper traction and experience on steep ice and snow. You would then return via Glacier Gorge to Bear Lake. A classic RMNP alpine route! Mt Alice from an unnamed tarn near Lion Lake #1. Mt. Alice is one of the more aesthetically pleasing mountains out there. It's one that always captures my imagination when I first lay eyes on it and is the main reason why Lion Lake #1 is so beautiful, in my opinion, as it looms high above the lake creating just about the perfect alpine backdrop. There aren't too many other scenes as beautiful. But this mountain makes you work. It's a long and steep approach, the final summit push doesn't come easy, from Hourglass Ridge anyway, and it gets you high into the thin air at well over 13,000 feet. So wear your big kid pants for this one and be ready for a super rewarding day in the hills! There are two main routes that lead to Alice's summit; Hourglass Ridge and South Ridge. I'll briefly touch on both. You can combine these to make a lollipop loop but I'd recommend going up Hourglass Ridge and down South Ridge. This is the most scenic route to the summit. Begin at the Wild Basin Trail Head on the southeast side of RMNP. Hike up the Thunder Lake Trail, past Calypso Cascades and Ouzel Falls, for 4.5 miles to the Lion Lake Trail. From here, things start to get steep. In 1.75 miles you'll come to Lion Lake #1. Follow the trail and cairns around the right side of the lake, crossing a couple of little streams. You'll work your way up to and above Trio Falls to Lion Lake #2. From there, gain the prominent ramp on your left that leads to the saddle between Alice and Chiefs Head Peak. This ramp is a highlight of the hike with incredible views, wildflowers (in season of course), and marmots! Once at the saddle, turn left to traverse Hourglass Ridge. This is a fun ridge that leads to the north slope below the summit of Alice. It's a little scramble but no climbing of any sort. Just a fun little ridge. But now the real fun starts! Head up the steep north slope which is kind of a series of ledges choked with talus. It's steep but a lot of fun! You top out on the summit with a couple of 'options.' The little knob to your right (west) is the true summit. The one on the left (east) has better views. They probably differ by a foot or so, so who really cares. But if you just have to make sure you tag the actual summit, it's the westward one. So there. This is the easiest route to the summit. Again, start at the Wild Basin Trail Head. This time go all the way to Thunder Lake, 6.2 miles from where you started. You'll find a trail that goes past the patrol cabin and skirts the northern side of the lake. Just follow this for a bit over a mile to Lake of Many Winds. This is a pretty steep little climb with one more super steep push to come. From Lake of Many Winds you'll see Boulder/Grand Pass looming high above your. Follow the trail around the south (left) side of the lake and do your best to gain access to the top of the pass. Note that this is extremely loose and steep terrain so take care not to knock rocks down on hikers below you and pay attention to what is going on above. If possible, go through this stretch one at a time. Or at least the more loose sections of the pass. One on the tundra at the saddle between Alice and Tanima Peak, turn north (right) and enjoy a pleasant tundra hike for just over a mile to the summit. Again, you can make a loop out of these two routes. I just prefer to climb up the steep north slopes instead of down climb it. So up Hourglass Ridge and down South Ridge. Kidding around on the summit of Chiquita! 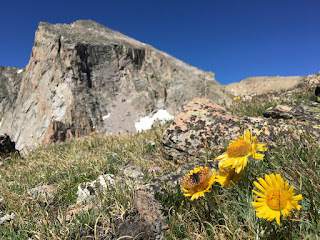 If you're wanting to see what it's like above 13,000 feet but just want to kind of dip your toe in to test the waters, then this is the mountain for you! And don't worry... you wont be giving up a thing even though Chiquita is arguably the easiest 13er in the state. You'll still experience a challenging hike along one of the national parks best and most scenic trails. To get to the Chapin Pass Trail Head you'll need to drive up Old Fall River Rd. This is a spectacular one way dirt road that is just open from July 4th through mid-Octoberish or as long as the weather stays good. You can get to Chiquita without Old Fall River Road or Trail Ridge Road being open, but it changes the nature of the hike entirely. So head up Old Fall River Rd for approximately seven miles to a small trail head with very limited parking (maybe 15 cars) along wide spots in the road. Gear up and hit the trail by making the initial grunt a quarter mile or so to Chapin Pass proper. Turn right by following the signs to Chapin, Chiquita and Ypsilon Mountains. The trail from here remains steep, but kind of rolls for a bit through beautiful intimate scenes, cliffs, tarns, and scenic overlooks. There will be another trail junction in this stretch but just follow the sign to "All Summits." Once you clear tree line the grade eases a bit as you traverse the entire lower slope of Mt. Chapin to the saddle between Chapin and Chiquita. From here it is a steep grunt up the elephant of a slope to Chaquita's wonderfully scenic summit. Watch for pikas and marmots along this trail through beautiful alpine tundra. Once you near the summit there is a little rock hopping as the grade flattens a bit. The summit is broad and there are good views to be had from anywhere, so poke around a bit. Take some pictures and be sure to breathe that thin, fresh, and crisp rocky mountain air from 13,069 feet above sea level. 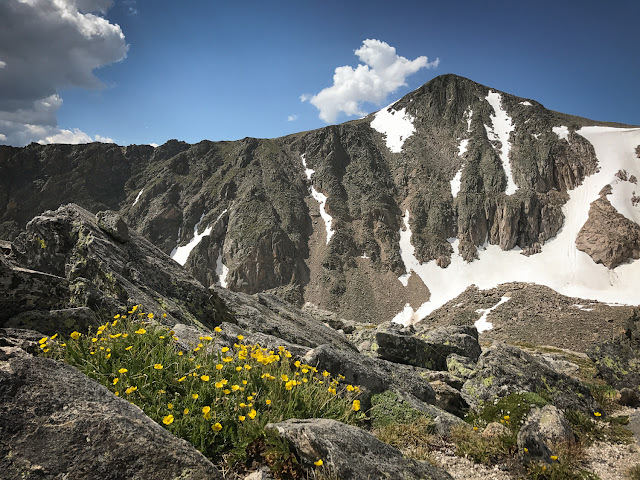 McHenry's Peak is one of the burlier non-technical summits in the park, and one of the prettiest, both the mountain and the route, in the entirety of Rocky Mountain National Park. Hit the trail at the Glacier Gorge Trail Head and follow the signage to Black Lake. These 5ish miles are worthy of the outing in their own right, but it just gets better. Once at Black Lake, follow the trail around the left side of the lake. Oh, and be sure to check out McHenry's looming high above you to your right (west). The trail will lead you away from the mountain up a steep gully that, when in season, can be chocked full, and I mean full, of wildflowers. Once on the shelf above the lake, follow faint trails back toward McHenry's Peak. Here, you'll also have a great look at Stone Man Pass, your first objective. You can see the scree and snow filled gully leading up to the namesake Stone Man high above. Work your way over and begin the climb. Just note that early in the season this can be avalanche prone and once the summer heat hits the snow it turns to hard ice and crampons and an axe may be needed to safely ascend. You can usually ascend on one side of the snow or the other and stay relatively safe but use caution here. Once at the pass turn right (northwest) across a choppy, boulder strewn slope to a series of gullys that lead to the summit. It is essential that you pick the correct gully in order to keep this route non-technical. Take the second gully (there should be cairns leading the way). It's a series of 3rd class rock ledges that lead you to the summit. Be sure to take note of where you are coming from. As important as it is that you pick the right gully on the ascent, it's more important to know which one to descend and it may not be as clear when looking from above. So take a few breaks to note your surroundings on the way up... especially when you top out. This is a spectacular summit, truly. The views of Long's Peak are unreal, as well as the views in any direction you look. Soak it in, weather permitting. Return, safely and carefully, the way you came. I couldn't make a list of summits in the park and not include Longs. No way. So here it is. The crown jewel of Rocky. The big dog. I'm not going to go into much detail about this 'hike' here as there are far better resources for gathering info about Longs Peak and if you really want to do this hike, or any hike on this page for that matter, please don't use the info here as your sole source of beta. But I'll give a bit of a rundown of Longs and maybe it will encourage you to dig a little deeper and start the planning process of summiting this incredible, awesome mountain. 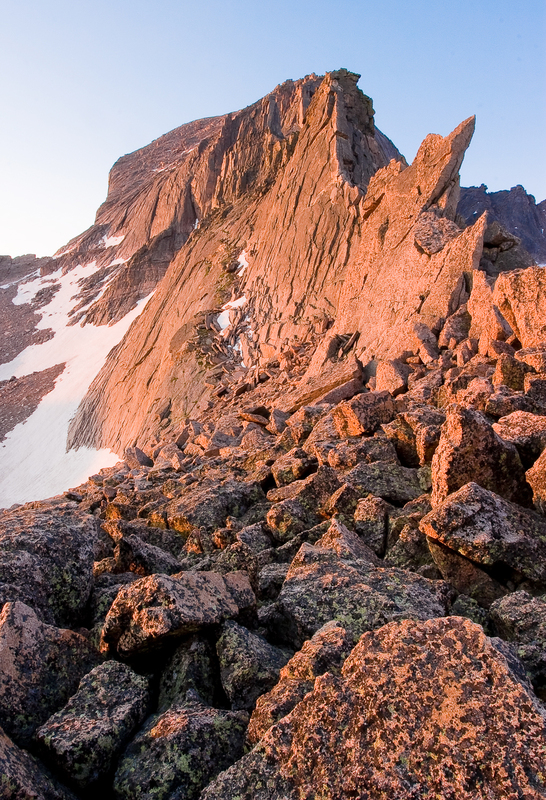 Once thought to be unclimbable, Longs Peak is one of the most popular 14ers in the country. It's a huge achievement for a seasoned alpinist or a casual peak bagger. There are more routes than I can count up the mountain with the easiest still coming in at 3rd class if the weather is good, which only happens a couple months of the year. Most routes are considered technical even in perfect summer weather, and all routes are technical when the snow is on the ground (which can be from September through June, and even sporadically in July and August!). The standard route, known as the Keyhole Route, is the easiest route up the mountain. From the trail head to The Keyhole is pretty straightforward, it's what's beyond the keyhole that gives this route its character. You have four distinct sections. Just past The Keyhole are The Ledges. A choppy series of ledges with some considerable exposure in spots. This terrain rises and drops to the base of the next section known as The Trough. This thing is a beast. 1,200 feet or so of steep up in a loose chossy gully. I try to make it up this as fast as possible to avoid getting pinged by a rock set loose by a fellow hiker above me. There is a 3rd class step at the top which spits you out onto The Narrows. Right at the start it's a little narrow, but has good holds. But the rest is like a highway and is a bit overhyped in my opinion. But to each his own. I think that the final section, The Homestretch, is the 'scariest' on the route. A steep slab with cracks leading you up to the summit. But it's definitely steep. And smooth in spots. There are a lot of people crab walking up and down this section as it commands your attention. A fall here could be, and has been, fatal. Use caution. We hope this at least helps steer you in the right direction when planning your summit hikes. A few other favorites are Mummy Mountain, Thatchtop Mountain, Mt. Meeker, Little Matterhorn, and/or Mt. Lady Washington. 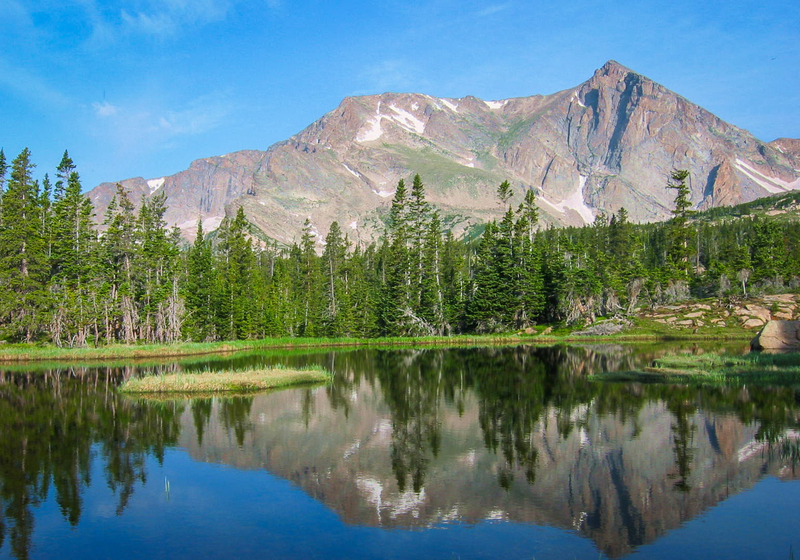 Each of these are incredible hikes and will give you everything you're looking for! Book: Rocky Mountain National Park - The Complete Hiking Guide by Lisa Foster. Just a little disclaimer. Go prepared. Do your homework. It's your responsibility to know the rules of the National Park and to travel in the back country safely and responsibly. These are only suggested hikes and your fitness level and experience level may not be what it needs to be to tackle any or all of these outings. Use common sense, choose safety first, and prepare as best you can. If you have any other questions or would like any more info, please leave us a comment below and we'll try to answer as best we can! Aahh I really wish to do hiking at all these summit hikes.Its one of my dream as I want something adventurous in life.Now let's see when will my dreams be fulfilled.